The post Your Dog Won’t Pee … What to Do Next by Jennifer Lesser appeared first on Dogster. Copying over entire articles infringes on copyright laws. You may not be aware of it, but all of these articles were assigned, contracted and paid for, so they aren’t considered public domain. However, we appreciate that you like the article and would love it if you continued sharing just the first paragraph of an article, then linking out to the rest of the piece on Dogster.com. Just like humans, most dogs have a daily routine when it comes to eating, sleeping — and, of course, relieving themselves. So, when dog parents notice that a dog won’t pee — or seems to be straining — it can definitely be a cause for concern. So, your dog won’t pee? Here’s what to do next. Photography © Wavetop | iStock / Getty Images Plus. According to Dr. David Dilmore, DVM, a veterinarian with Banfield Pet Hospital, when a dog won’t pee or a dog is straining to urinate, pet owners should look for their abdominal muscles tightening or a change in posture when they get in their normal position to relieve themselves. What If Your Dog Won’t Pee at All? 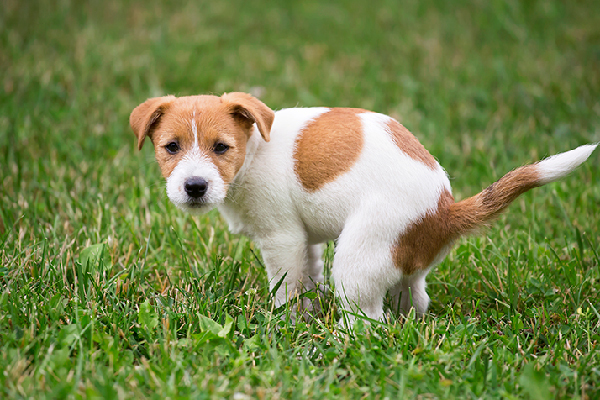 What Causes a Dog to Stop Peeing Normally? Dr. Scott says the most common cause of a urinary obstruction is urinary stones, but tumors or irregular muscular contractions can also cause these problems. Dogs with bladder irritation or infections very commonly strain to urinate, but are able to void their bladders completely. “It often requires a veterinarian to feel a dog’s bladder to know if it is too large or if it is a normal size,” she explains. If your dog won’t pee, your veterinarian might perform tests including a urinalysis, urine culture, blood work, x-rays and/or ultrasound. “Treatment will vary based on the individual pet and the underlying cause of straining, but could include antibiotics, diet changes or even surgery,” Dr. Dilmore adds. Dr. Spangler explains that urinalysis will assess for bacteria, crystals, abnormal cells, pH and the concentration of the urine. Radiographs may be done if there’s suspicion of a stone somewhere in the urinary tract, and ultrasounds can be used to rule out tumors in the bladder and prostate. Your veterinarian may run blood work if they suspect a metabolic issue, such as a portosystemic shunt causing stones, particularly in younger dogs.